New Delhi: The Vishwa Hindu Parishad (VHP) is organising a Dharam Sansad - the conclave of Hindu priests at the famous Ramlila ground in the capital Delhi on Sunday demanding the early construction of a Ram temple in Ayodhya. “The rally will pressurise all political parties to pass a Bill for the construction of a Ram temple by Parliament during winter session,” VHP Joint Secretary Surendra Jain said here. 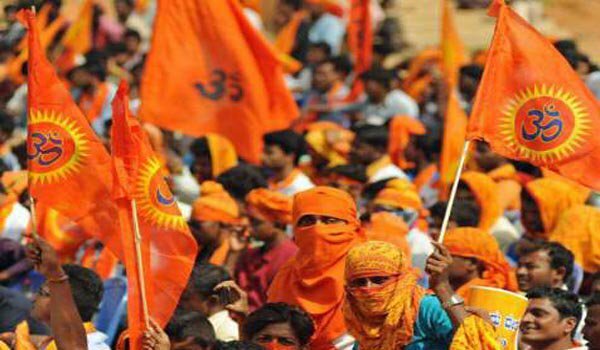 VHP spokesman Vinod Bansal said: “It will be a massive gathering which will change the hearts of all those who are not in favour of bringing the Bill for construction of a grand Ram temple”. The VHP show in the capital would come just days before the winter session of Parliament begins. What is being regarded as the last full-fledged parliament session under Narendra Modi-led dispensation, the proceedings of both the Houses would commence on December 11. Stating that a huge rally is being organised by VHP at the spacious Ram Lila Ground at around 8 am, Delhi police have announced traffic restrictions and advisory for the citizens. “On the basis of real time situation, necessary diversion of vehicular traffic may be made. Keeping this in view the general public is requested to avoid certain ear-marked routes,” a police source said and counseled that the people should rather use public transport. The VHP had already observed Shaurya Diwas to December 6 to mark the anniversary of the Babri Masjid demolition. The influential organisation has been carrying out door-to-door campaign in the national capital and its adjoining areas to make their Sunday rally a grand success and also to pressurise the Modi government to take concrete steps for the construction of grand Ram Temple at Ayodhya.